We were recently working on a spinette desk when we found an aged leather folder. It contained WWII documents of a GI. It will be returned to the owners of the desk, who told us that it has been in their family for some time. 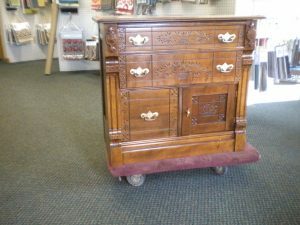 During the 80’s, when I did most of the work myself, I had just picked up a small wash stand for restoration. As I laid it on its back I saw an envelope taped to the bottom. It contained several hundred dollars. There was delight and a smile on the customer’s face when I gave her the envelope. She told me he had a habit of putting things away for “safe keeping”, but it was a few years since he had passed. She was still finding his hiding places. Finally I was working on a Mahogany roll top desk. It belonged to an electrician who told me he had obtained it from his first employer and mentor. As I was getting it disassembled to work on, I found a cancelled check, dated in the 1930’s, payable to a lady for whom I had recently completed an order. Yes, I handed it back to her and she too had a smile on her face as the memories came back. So before you sell, give away or have furniture worked on, look it over very carefully. You could be as surprised as these customers were.